STGuitarworks as a repair business is closed for the time being to focus on the advancement of my manufacturing competence to satisfy the ST Vision. 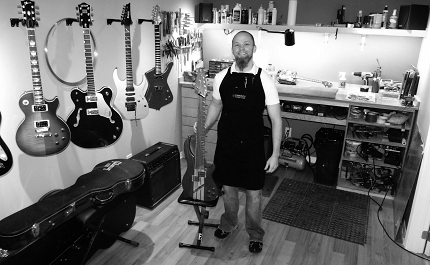 I worked for the Godin Guitar Company from '04 to '06 in Montreal West Island, QC, responsible for all their Canadian warranty and nonwarranty setups and repairs. 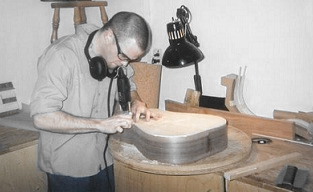 In 2003 I attended the Summit School of Guitar Building and Repair's Masters Course on Vancouver Isl., BC (operated by luthiers Mike Jarvis and Sigmund Johannessen). One month was spent in Umeå, Sweden, training with luthier Leif Jakobsson, proprietor of Jakobsson Guitarworks. I have been a member of the Guild of American Luthiers and I attended their 2004, 2006, 2008 and 2011 conventions held in Tacoma, WA. I operate from my workshop near the Blair / Ogilvie exit of the 174 / 417 in Ottawa.